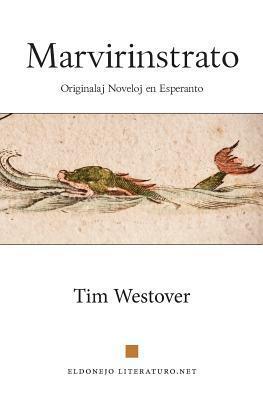 From my LiveJournal review:Marvirinstrato is a collection of original short stories in Esperanto by my friend Tim (some have won prizes in the big annual Esperanto literature contest). He self-published the book, using one of these online print-on-demand houses (in fact, probably Amazon.com, I think?) but the quality of the physical book (paperback) is excellent! If I saw it in the store, I would not have guessed that it was print-on-demand and not printed in a mass-quantity press run. Technology not only for digital distribution of books but also for physical distribution of books is making significant strides. Speaking of which, the book is available for free download in PDF format (or HTML even). The book is licensed under a Creative Commons license, which permits sharing and copying (as long as it's non-commercial, attributed, and not changed). Still, the assumption is that Esperanto speakers will want to support Esperanto literature by purchasing the book. Even those who read the PDF have purchased physical copies -- I guess people still like to collect things ... and get them signed by the author.I really enjoyed the book and I can see it being a point of reference in the Esperanto community, both as an important literary work and as a pop culture source. I suspect that because myself and others have already started making quips in conversation or on Facebook mentioning elements from various stories. Most of the stories in the book are like fables; they take place in worlds almost similar to our own but with fantastic elements. Mixed in is a playful advertisement for a fake product, Pharoah's Flour, which is referenced in a few other stories. All the stories are playful and witty, but have a seriousness or moral to them. And the fantasy elements are fascinating, making the stories gripping, as I want to follow how these fantasy worlds play out. And each story creates a new world to explore. So you can hopefully see how this provides an abundance of referents. Unfortunately, I didn't feel that there was any story whose ending was pefectly satisfying -- where everything came together and fit perfectly or there was an ironic twist -- but the stories were, as I said, gripping, so there was still enough to make the book enjoyable. And, as I've also said, there's enough substance to make the book one that you can keep referring back to and still find new meaning in.The language in the book is very smooth, I felt, making it an easy read. Though there was no shortage of new words that I had to look up. I kept a list of words that were unfamiliar or that I knew but felt were unusual enough to write down. I listed them in my LiveJournal review. Mi legas tiun rakontaron de tempo a tempo. Gxi plenas je lerta rimarkadojn pri ordinaraj personoj, plej ofte je neordinaraj kondicxoj. La reklamado pri faruno estas amuzega. Mi forlasis la rakonton "Tri rugxaj knabinoj", cxar gxis postulas tro da tempo ke mi havas nun, sed mi legis la farunreklamado, kaj ridadis. Pretty good. These stories are quite interesting, and usually a bit weird. It's hard to know what to make of them sometimes. Nonetheless, I would definitely recommend them to people. Mi legis tiun ĉi libron dum pli ol duonjaro, lente kaj foje, dum mi plibonigis mian esperanton. Mi devas diri ke en la mondo de esperantaj legaĵoj, estas multe da vere neelteneblaĵoj, kaj mi estas ege dankema al libroj kiel tiu. Kelkfoje mi ne havis grandajn reagojn al la noveloj, aŭ mi apenaŭ komprenis ilin (Marvirinstrato, Kuko del' Sabla Maro(tiun lastan mi ne eĉ finis) sed estis ankaŭ plurajn kiujn mi vere aprezis.Mi pensis ke Tri Ruĝaj Knabinoj estas bonega verko de "infaneca surrealismo" kiu celas al la strangeco de juna amo. Tiu ĉi estas probable mia plej ŝatata el la verkaro.Mi ankaŭ trovis Akvoturo, Akvokruĉo kiel elstaranta ekzemplo. Parte ĉar ĝi havas socian konsciencon kiu ne troviĝis alinovele. Li descendis el la mitaj nuboj kie li kutime skribis kaj, se nur foje, dum kelkaj alineoj, li kuraĝis trakti realaĵon. Mi ne intencas malpliigi la mitajn nubojn, ĉar li skribas tiamaniere tre bone, sed tiu momenton ekkaptis mian atenton. Mi ne komprenas, kial la titolo enhavas la anglajn vortojn "(Esperanto Edition)". Mi tre dubas, ĉu ekzistas alilingva eldono. Mi mem klopodis angligi unu-du rakontojn, sed neniam finpoluris ilin kaj ili ne eldoniĝis. Sed kelkaj el la noveloj estas inter la plej amuzaj (kaj iel profunde-supraĵece pensigaj), kiujn mi iam legis en Esperanto.